The female Kestrel was back on Buck Hill, perched on a horse chestnut tree on a dim grey morning. Both the Peregrines were on the barracks tower. 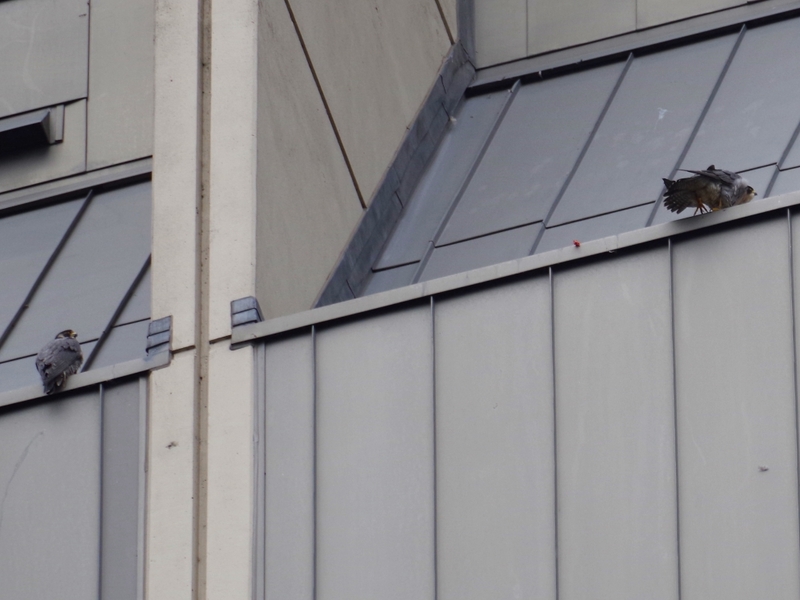 A small fragment of an unfortunate Feral Pigeon can be seen on the ledge between them. Another pigeon was being finished by a Lesser Black-Backed Gull, not one of the dominant pair, but these get so many pigeons now they no longer have to bother about who eats the leftovers. 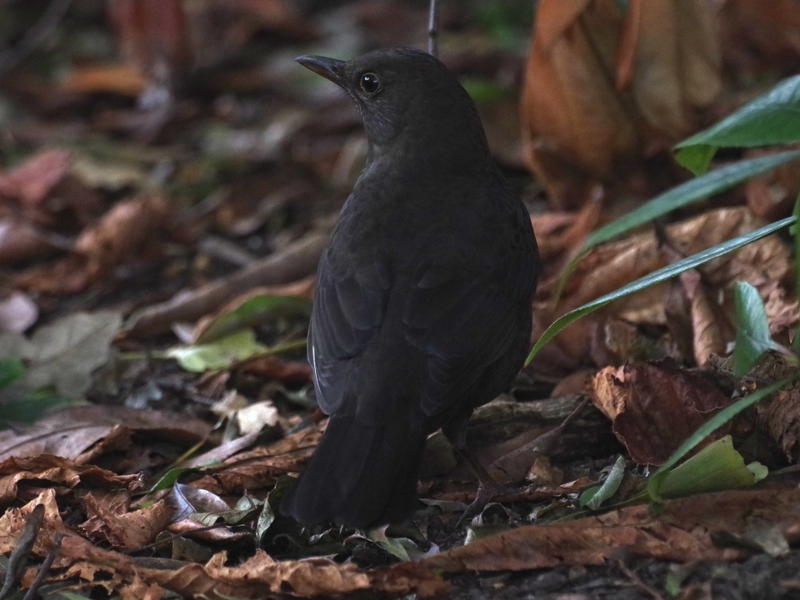 ... where a Blackbird was foraging in the shadows under a bush. 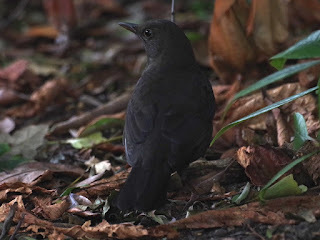 This is an immature male, probably a migrant, already in adult black plumage but still without the adult's bright yellow bill and eye ring. 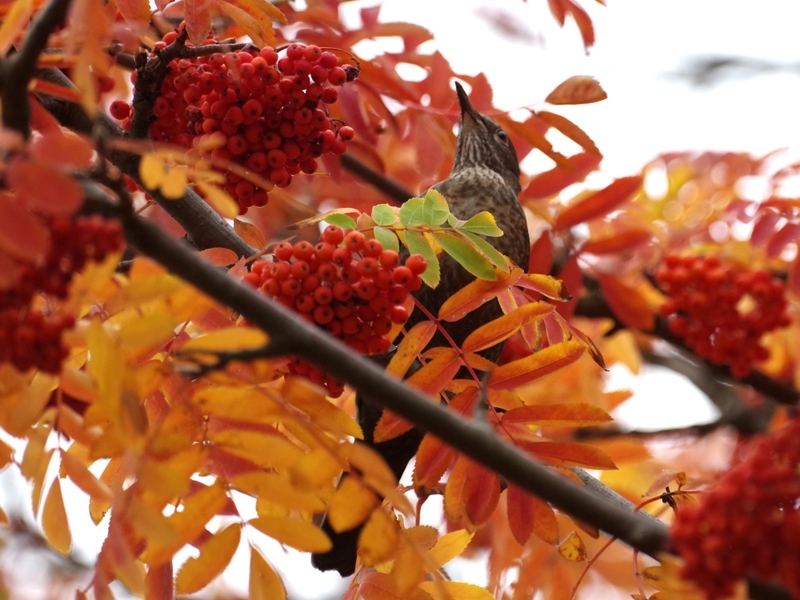 A female Blackbird flew into the fruit-laden rowan tree on Buck Hill. 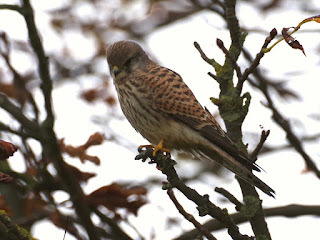 When I revisited the tree in the afternoon the weather had brightened up. A Jay looked out, expecting a peanut. 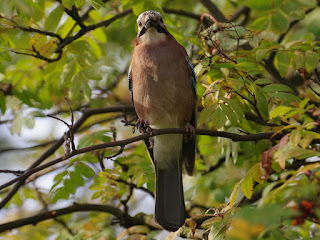 They don't seem to eat the fruit, though Magpies do. 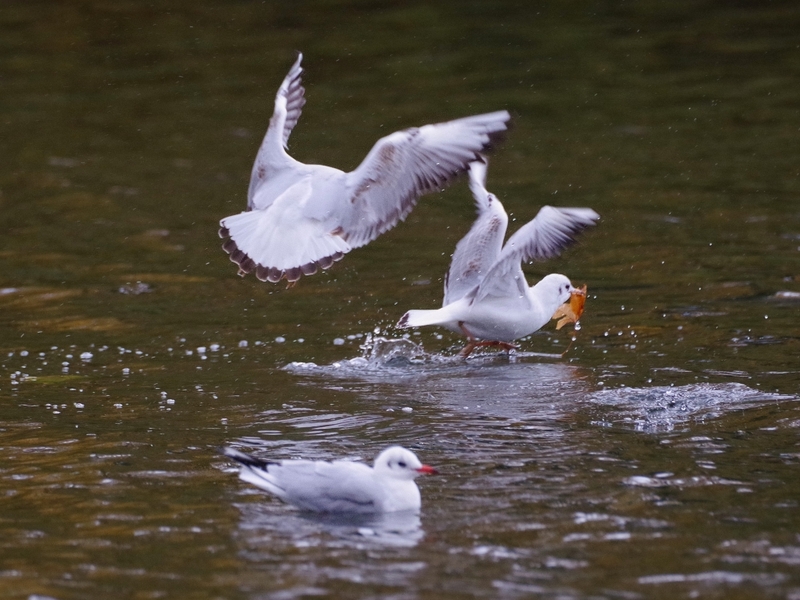 Young Black-Headed Gulls squabbled over the ownership of a dead leaf. 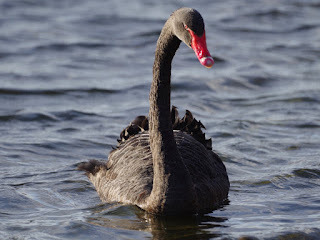 The Black Swan came over to be fed. I went to St James's Park to see the Black Swans there. Sadly, the pair are down to their last cygnet. The last time Black Swans bred in this park, they lost all their cygnets. 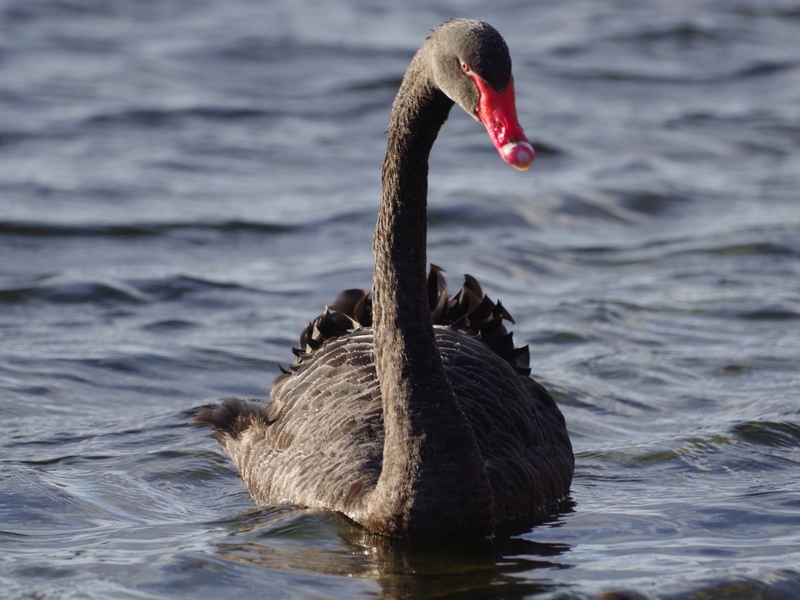 It's not clear why their survival rate is so much lower than that of Mute Swans. A first-year Mediterranean Gull has been in St James's Park for several days, and i found it preening at the east end of the lake. 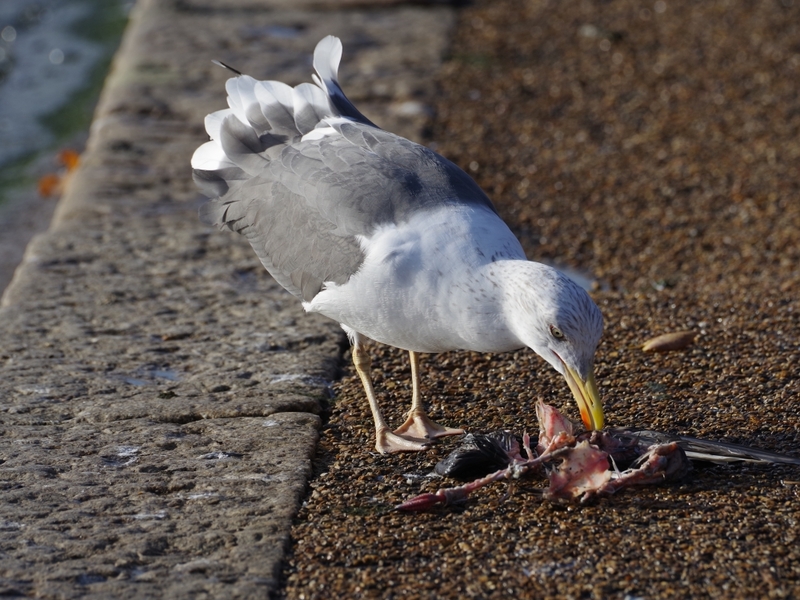 It looks quite like a Black-Headed Gull, but note the black bill and dark grey feet. The were also two Little Grebes, the first time I've seen them there for a while. 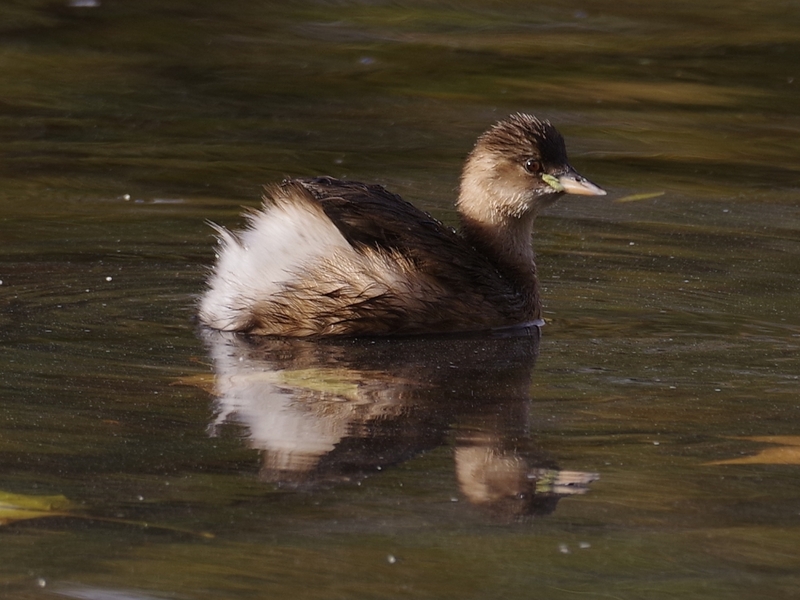 A pair of Great Crested Grebes have three remarkably late-hatched young, only a couple of months old and still begging loudly for food. One of them had a go at flying, but didn't get off the water. 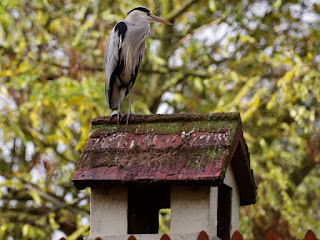 A Grey Heron perched on the chimney of Duck Island Cottage, a building of 1841 by the otherwise unknown architect John Burges Watson in a style vaguely supposed to be like a Swiss chalet. The history of Duck Island goes back to the 1660s, when Charles II improved St James's Park and gave the post of Governor of Duck Island to his favourite courtier, the Seigneur de St-Évremond. 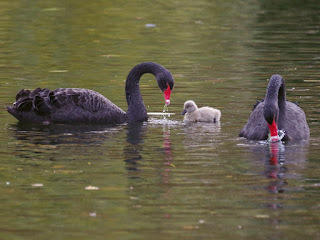 I was in St James’s Park too and was saddened by the loss of so many Black Swan cygnets. One of the parents spent a long time chasing a young Mute Swan which seemed to be a pointless activity, when it should have been helping its mate protect the survivor. Territorial birds just can't help doing that. You often see it in Egyptian Geese with goslings, endangering their young. 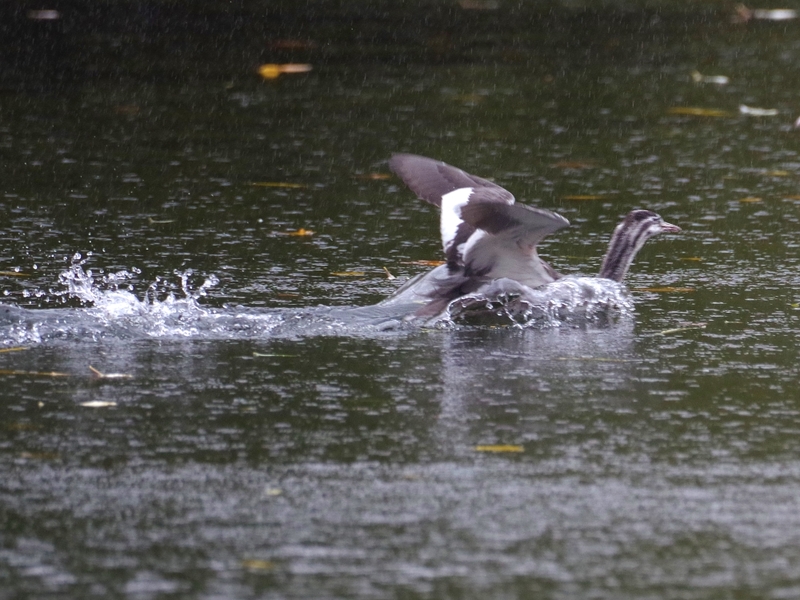 I also appreciated the Gadwalls, of which there were a surprising number. Nice to see the footage of the Med Gull. I had been thinking about going to look for it soon. The adults are such smart birds. I read on the Dungeness blog a couple of weeks back there were 2,000 off shore- an amazing count- how times change! It's odd that when Mediterranean Gulls come up the estuary they usually seem to choose St James's Park. Perhaps just because it's near the river. I've been doing WeBS counts along the Thames between Putney + Barnes Bridges for probably over 30 years + have yet to find one, though they are occasionally seen at the London Wetland Centre. 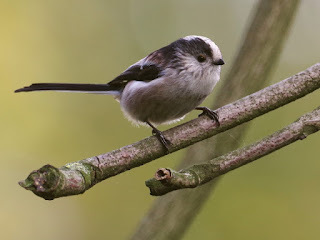 I did find one on Richmond Park's Pen Ponds a few years back- again a 1st winter bird. The Med Gull in St James's Park a few years ago was also young. Maybe it's because they get lost more easily.